We're not calling you dummies, just thought I'd get your attention. My colleague from our HQ in NC put together this super fantastic, highly-detailed report about the Confederations Cup. He did use much of the info from the BBC, thus I thought I would mention that, so as to appease our lawyers. I know this is unorthodox for our blog, yet that's what we're all about here: new and change. And no, I'm not trying to get out of actually writing a blog today. On Sunday, the eight-team Fifa Confederations Cup gets under way in South Africa when the host country take on Iraq in Johannesburg. It is the eighth edition of a tournament that is still something of a mystery to many football fans around the globe. The competition began life in 1992 as the King Fahd Cup, the brainchild of the late Saudi Prince Faisal ibn Fahd. The four-team tournament comprised Saudi Arabia, who were the 1988 Asian Cup winners, Argentina, the 1991 Copa America champions, 1991 Concacaf Gold Cup winners USA, and Ivory Coast, victors at the 1992 African Nations Cup. Alfio Basile's Argentina triumphed, beating the Saudis 3-1 in the final in front of 75,000 fans thanks to goals from Leonardo Rodriguez, Claudio Caniggia and Diego Simeone. The second edition also took place in Saudi Arabia in 1995, this time the hosts were joined by Argentina, Mexico, Japan, Nigeria and Denmark, who beat the 1992 champions 2-0 in the final. It became known as the Confederations Cup in 1997 when Fifa took control of the competition. From then on it was staged every two years, with Brazil and France (twice each) and Mexico all triumphing. From 2005, Fifa announced that the cup would be held every four years, one year before each finals tournament in the host country of the forthcoming World Cup. Which means, with less than a year to go before the World Cup, it is the turn of South Africa. 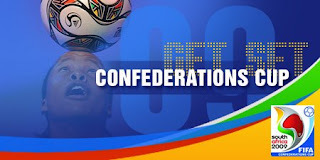 Having started as a relatively small-time affair between the winners of four continental cups, the Confederations Cup is now of paramount importance. This year's tournament, as it did for Germany in 2005 and Japan and South Korea in 2001, gives South Africa the perfect opportunity to fine-tune its hosting skills ahead of putting on one of sport's greatest events next year. The state of their stadia, transport links, ticket sales, marketing campaigns - you name it, if it is on the agenda for the World Cup, it is almost certainly being tried out this time around. Even South Africa's notorious crime rate will be monitored to see what measures can be put in place before the entire footballing planet descends on the southernmost corner of the continent in 2010. About £1.2m has been spent on marketing the so-called 'Festival of champions' to try and generate interest in the host country, with ticket sales relatively slow. "The campaign is good," said Fifa secretary-general Jerome Valcke. "It would be a shame if we don't have full stadia. It is a unique chance, it is something special." On Friday, two days before the start of the tournament, organisers revealed all but 1,000 tickets has been sold for the opening match and 453,218 of the 640,000 tickets, or 71%, had been snapped up for the entire competition. World Cup organising chief Danny Jordaan added: "We feel confident we are going to deliver a hugely successful Confederations Cup." Fifa will be watching on with interest, president Sepp Blatter casting his eye over proceedings to make sure the South Africans can produce in 2010. "It's definitely time to kick off now, not only in terms of the organisation, but in terms of making sure they can deliver and will deliver," said Blatter. "This cup, one year before the big event, is crucial." There are eight teams participating in this edition, with South Africa taking their place as hosts and Italy as 2006 World Cup winners. The following champions are also present: Spain (Euro 2008); USA (2007 CONCACAF Gold Cup); Brazil (Copa America 2007); Iraq (2007 AFC Asian Cup); Egypt (2008 African Cup of Nations) and New Zealand (2008 OFC Nations Cup). If you thought some of the bigger teams participating would not take the competition seriously then think again - these squads are at virtually full strength. The only big names missing are Brazil's Ronaldinho and Spain's Andres Iniesta, the former dropped by coach Dunga and the latter missing through an injury he aggravated during the Champions League final. But the cast list is still mighty impressive: Kaka, Robinho, Luis Fabiano, Gianluigi Buffon, Andrea Pirlo, Luca Toni - not to mention Spanish sensations Iker Casillas, Xavi, Cesc Fabregas, David Villa, Fernando Torres et al. Italy's World Cup winning-coach Marcello Lippi and Spain boss Vicente del Bosque both have their sights set on lifting the trophy in Johannesburg in a little over two weeks' time. "The Confederations Cup will be an important test for us," said Lippi. "I want us to go all the way and I also want to recreate a team spirit similar to that of the World Cup." Del Bosque added: "All the teams have their best squad. We are going with the squad which we feel is the best and are obligated to enhance the prestige of this cup." Four World Cup venues will be hosting the Confederations Cup, all stadia that are due to hold matches at the 2010 tournament. They are Ellis Park in Johannesburg, Loftus Versfeld Stadium in Pretoria, Vodacom Park in Bloemfontein and Royal Bafokeng Stadium in Rustenburg. Port Elizabeth's Nelson Mandela Bay Stadium was originally chosen as a venue, but it withdrew last July as it was not on course to meet the 30 March deadline for completion. The opening match, between South Africa and Iraq on Sunday 14 June, and the final on Sunday 28 June, will both be played at Ellis Park. For a tournament still in its infancy, the Confederations Cup seems to have had more than its fair share of dramatic moments. In 1997, the awesome Brazilians put on a show of super football to demolish hapless Australia. The great strikers Ronaldo and Romario ran amok, scoring a hat-trick apiece in a 6-0 demolition. Two years later, Brazil were foiled by Mexico in the final as they went down in a 4-3 thriller, Miguel Zepeda scoring twice for the hosts in front of 110,000 people in Mexico City. The 2005 edition enjoyed a phenomenal finale too, as Brazil swept aside arch rivals Argentina 4-1, with a scintillating display of attacking football and goals from Adriano (two), Kaka and Ronaldinho. But the overwhelming memory from past tournaments is one of tragedy, after the death of Cameroon midfielder Marc-Vivien Foe in 2003. Foe, 28, suddenly collapsed in the 72nd minute of his team's semi-final against Colombia and died in the Stade de Gerland's medical centre of a hypertrophic cardiomyopathy. He was decorated posthumously as commander of the national order of valour by Cameroon prime minister Peter Musonge at his state funeral in Yaounde. After France defeated Cameroon in the final, two of Foe's team-mates held an enormous photo of him at the post-match ceremony and a runner-up medal was hung around it. As long as the Confederations Cup is in existence, it will forever be remembered for the tragic loss of a talented young footballer in his prime.